On February 20, 2015, the men imprisoned in the Willacy County Correctional Center in Raymondville, Texas, took it over en masse and destroyed it. This was the most recent in a string of uprisings that have taken place since the government began incarcerating immigrants on a mass scale for “improper entry” and other minor offenses: in September 2008 in Big Spring, Texas; in December 2008 and January 2009 in Pecos, Texas; in April 2010 in Eden, Texas; and in May 2012 in Natchez, Mississippi, to name only known cases. The information available to the public about the Raymondville uprising is insufficient, as in previous instances. Media reports have mentioned some of the inmates’ possible grievances—we return to these reports below—but have not relied on any direct statements from the inmates. What we do know is that the uprising lasted two full days and succeeded in forcing the Bureau of Prisons (BOP) to transfer all the inmates and cancel the federal contract with the facility, which is privately operated by Management and Training Corporation. No More Deaths seeks to stand in solidarity with incarcerated immigrants. We affirm the right of members of an unjustly criminalized population to resist. 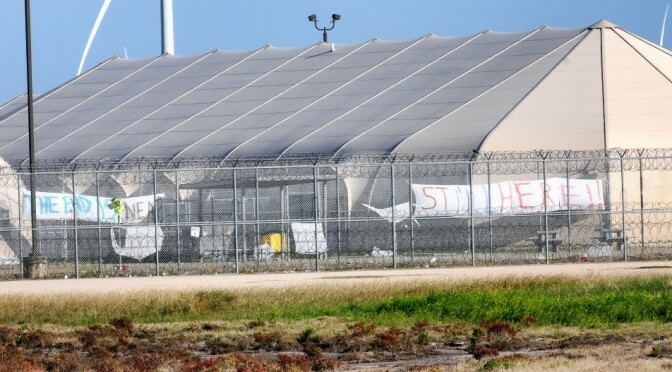 When another uprising like Raymondville occurs, people of conscience should saturate the facility and the BOP administration with support for the inmates, insisting on dialogue with them, attention to their grievances, and an opportunity for them to be heard publicly. Our concern and interest is based on 11 years of humanitarian work serving undocumented immigrants in the Arizona–Sonora borderlands. Many of the people sent to jails like Raymondville, all along the US–Mexico border, are among the 40,000 prosecuted annually in Arizona by the US Border Patrol. These incarcerated immigrants are a diverse population, ranging from migrant workers to lifelong US residents. Our Property Recovery Assistance Project serves them specifically. We recently published a report on how incarcerated and deported immigrants are systematically robbed of money and property. We know that these people do not belong in prison. More importantly, they know it. We believe this explains the high frequency of uprisings in such a low-security category of inmates. We believe the basic lesson of these uprisings is that people subjected to vicious criminalization, based on racism, will not stop resisting. Incarcerated immigrants, despite the differences among them and the isolation imposed on them, are capable of uniting. If they can take a stand, if they can unite, we have no excuse for not doing the same. This month, 13 members of the Tucson immigration-justice community went on trial for their actions on October 11, 2013; five others faced down federal charges a few months ago. These activists succeeded in canceling that day’s Operation Streamline proceedings—a barbaric spectacle where immigrants are led in chains into a courtroom, judged en masse, and sentenced to prison—by blockading buses carrying the accused to the courthouse. Their actions reflect the depth of our community’s moral outrage at the criminalization of immigrants. The Evo A. DeConcini Federal Courthouse in downtown Tucson is, to us, not a temple of justice but a den of thieves. It is a house of exchange where our government converts brown people into a commodity for the benefit of private prison companies: Corrections Corporation of America, GEO Group, Management and Training Corporation, and others. The American Civil Liberties Union has called for an independent investigation of the Raymondville uprising by the Inspector General of the Department of Justice. We endorse this call. Reportedly, the inmates were motivated at least in part by anger about substandard health care. The awful conditions in the BOP’s privately run immigrant prisons are certainly well documented. The Raymondville inmates even referred to their prison as Ritmo—a blend of Gitmo, the notorious Guantanamo Bay prison, and Raymondville. Another account of the uprising comes from the company that runs Ritmo. Management and Training Corporation says the uprising was not about poor conditions; rather, it was orchestrated by Mexican inmates who wished to be moved to a different location on the border and thereby (upon completion of their sentence) be deported to a different part of Mexico, which they felt would be less dangerous for them. Notwithstanding the fact that MTC’s account obviously serves its self-interest (deflecting accusations that it was running a gulag), it will be no surprise to us if an independent investigation does indeed find that prisoners feared for their safety if deported straight from Raymondville. Raymondville lies at the eastern end of the US–Mexico border. In 2011, we received a series of letters from inmates of the Torrance County Detention Center in Estancia, New Mexico, who had been arrested in Arizona. These men were terrified of being deported to the eastern border, where violence was and is intense and where they expected to be targeted by organized crime. They wrote: “PLEASE SAVE US. We are scared for our lives.” These terrors have not gone away. Both inhumane detention conditions and deportations that recklessly endanger people’s lives are legitimate grievances and grounds for resistance. They are not “ploys” or “pretexts,” as MTC would have it. We should address these grievances, and we should also address the most fundamental injustice: denying people legal opportunities to migrate, criminalizing immigration and immigrants.